A typical scene in small town! Narrow street with shops on both sides, people, cars, two-wheelers AND animals! The lady in yellow was taking the mules to deliver cement bags. 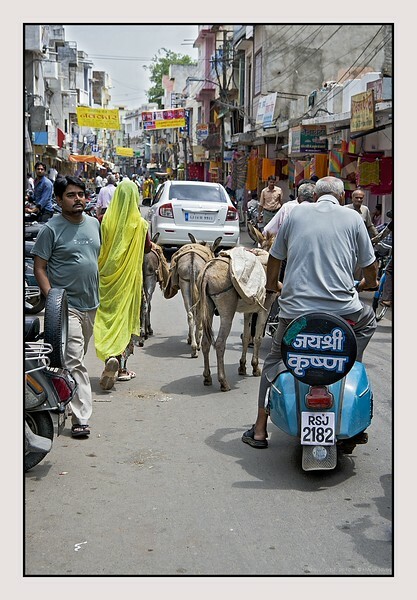 This shot has me longing for India... Thanks Hershy. Great street shot, so much to look at. I love the mixture of the cars, motor bikes and mules! So much going on in this street. Nice shot. WOW...That is one busy street! So many interesting things to see...great capture! Fantastic shot, lots going on here. Fascinating street scene and so much going on...can feel how busy it is in the image..I'm sure to be there is even moreso!